It has been a month since we began our little project upstairs and kissed showering goodbye. Finally, this week things are starting to get fun. By fun I mean, they are starting to look better and not worse. 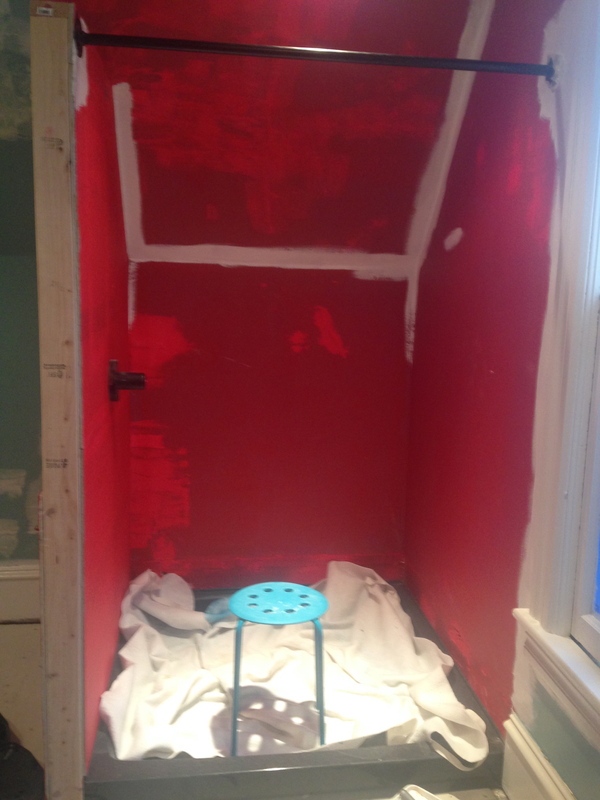 We painted a water-proofing compound in the shower area. It was weird, thick pudding-like stuff that dried hot-pink. The shower curtain rod was also installed. 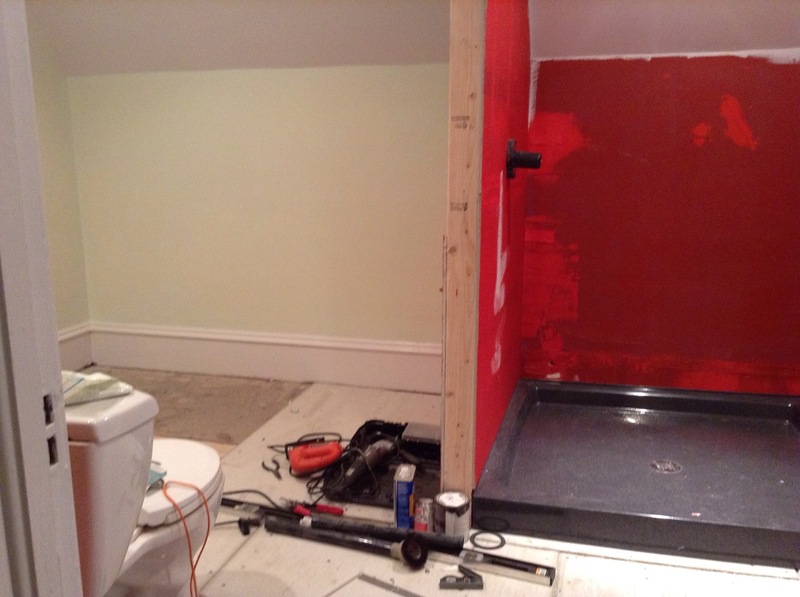 It needed to serve as a way to strengthen the wall we built to house the shower, so we used iron gas pipe and just painted it with the same black paint used to paint the tub. Our shower base came in and (bonus!) fit into the space we had built for it. The thing about the shower base: I have a love-hate thing going on where it is concerned. Love: it looks nice, it will last forever, it was a piece of cake to install (basically just drop it in and you’re ready to go). Hate: It was so darn expensive that it makes me want to puke. 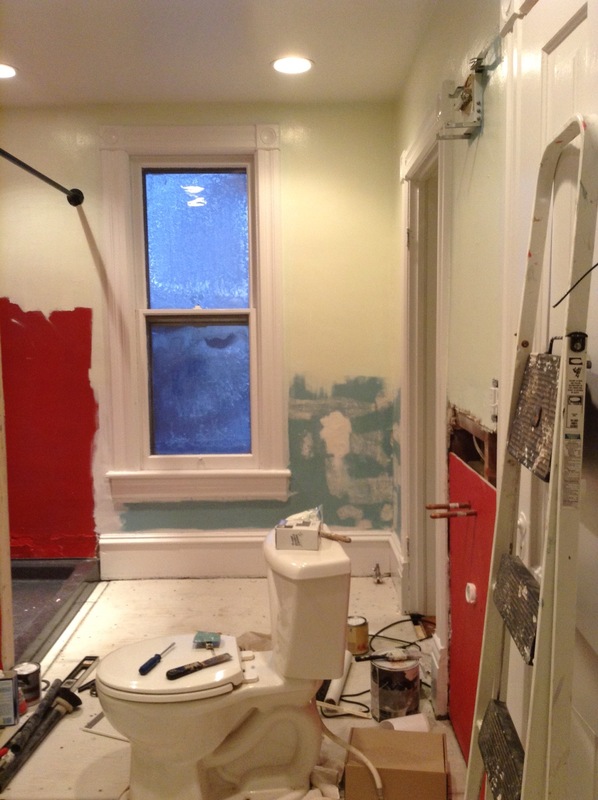 I won’t go into details, but it will cost us more than any other part of our bathroom. It was either go with the cheap, ugly white vinyl base that won’t last or look very nice for too long, or pay 6x more for the fancy acrylic polymer one that will last and look nice forever. We went the expensive route here, which is not something I am used to doing. I guess the 3rd option was to build a base from scratch, but Lance was having none of that. Plus we would like to shower sometime before Spring. I painted the trim and ceiling (Decorator’s White by Benjamin Moore) and the walls (Cabbage by Valspar). I was right. I liked the Cabbage color much more outside of the closet. I painted for 12 hours on Saturday, determined to get.it.done. I was forced to quit when I ran out of paint with about 10% of the walls to go. The next day, we picked up a quart of the same color, same paint. However, after painting the rest of the room and touching up spots on all of the walls, I realized that this was NOT the same color. It was more… yellow. Not good. Now I had yellow splotches all over the room. Bah! I went back to ACE Hardware today to explain what had happened, and they fixed the problem. It turns out that the colors they used to mix the gallon are three completely different colors than used to mix the quarts. The result was 2 colors very similar to each other, but, different! Crazy. 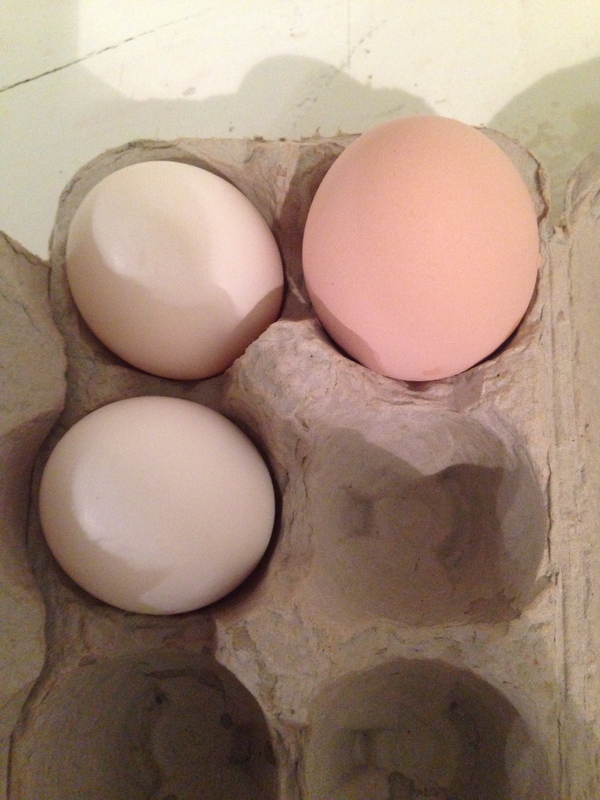 In non-bathroom related news, the chickens began laying again! Between the 4 of them, they are giving us 3 eggs a day- that’s 21 eggs a week!